You can create rules that apply to specific public holidays only. For example, the Restaurant Industry Award 2010 specifies that a 225% penalty rather than 250% penalty should apply when Christmas Day falls on a weekend. Please note that if you are on a Managed Template in Tanda, double check if this condition has been built in with Tanda's support team. select if it is ordinary hours or overtime hours. See this article for guidance on creating award rules. You will need to create it with the exact wording specified in your Tanda accounts pre-built holidays. 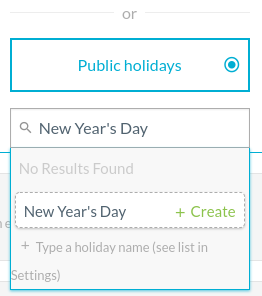 You can find the exact name to tag the public holiday under General Settings. 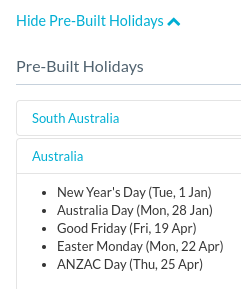 Select Show Pre-Built Holidays to see a full list of public holidays specified for your Tanda account. Start to type the specific public holiday name that you are creating an award rule for and select the green '+ Create' button. 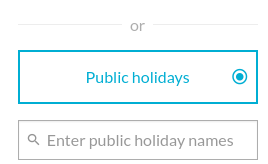 On the award rules summary page, you should see Specific Public Holidays show up under the Applies On column. If you would like further assistance, please contact Tanda Support by clicking on the blue chat icon in the bottom right corner, calling 1300 859 117 or emailing: support@tanda.co.